Hello Everybody! 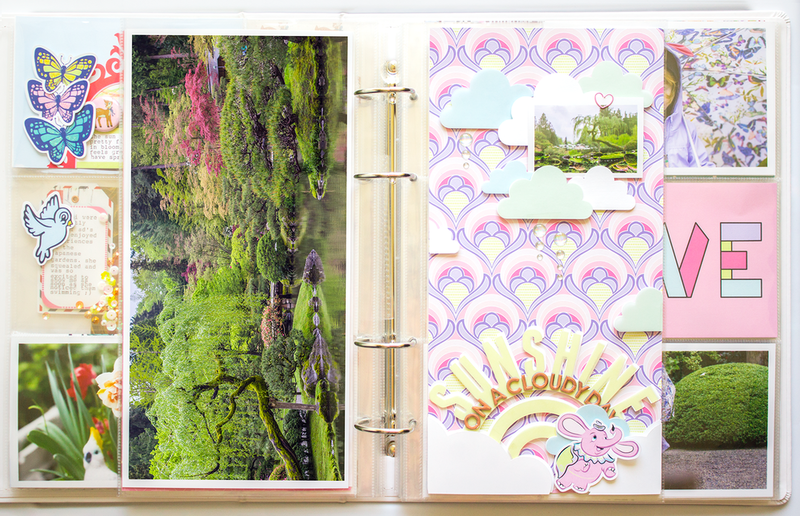 It's Carrie here again with another layout using the lovely Wonderful World of Disney Kit : ) This time I've paired a 6x12 layout with a full page 6x12 inch photo and placed it directly into my 9x12 inch Project Life album for this year. The photos in this spread are from our trip to the Japanese Gardens here in Seattle. Originally, I was planning on using this kit to scrapbook more photos from Disneyland. However, when I realized that I could get away with using these photos instead I was thrilled! I can't believe how much the product from this kit brightens the mood of my photos taken on such a dreary day lol!! Okay, so to get started I chose my background paper as usual. This retro design is one of my many favorites in this collection! Next, I chose the 6x12 inch photo to pair it with. Even though it was early Spring when I took this scenic photo there is just enough color to get away with placing these two side by side. Once I realized that Dumbo the flying elephant would match my paper, the idea of him flying in the clouds came straight to mind. 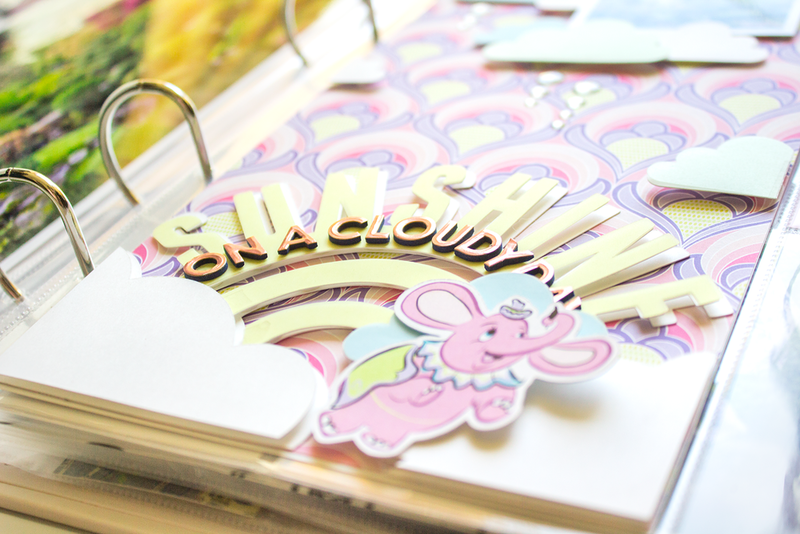 I promptly made a trip to the Silhouette Design Store online and chose this Sunshine Clouds cut file by Loni Stevens. The idea of clouds since it was such a rainy day seemed perfect. Before I cut this file I resized it to just over 6 inches wide so it would take up the entire width of my layout. Then, I ran white cardstock through my Silhouette Cameo and cut out the clouds and sun with text. Since the cut file comes with two pieces which you layer together, I decided to make a third cut and used yellow vellum which I layered over the top layer of the sun and text. To adhere the bottom layer of the entire design to my background I just used regular adhesive. For the top/ second layer, I used foam adhesive for dimension. Before I attached the second layer of the sun and text I adhered the yellow vellum to it using just a little red line tape in areas which I knew would be covered later by either a cloud or text. Since the text says "sunshine" I thought that adding "on a cloudy day" was appropriate and spelled it out using the rose gold Auburn Lane thickers from Pink Paislee. Song lyrics for the win! Lol!! At this point I knew I wanted more clouds so the entire page felt like the sky. So, I went back and chose another cut file, this one is called Clouds by Patty Young Designs. Before cutting this design I also resized it to just under 6 inches wide. Then, I used the original size which I cut twice, once normal and once flipped horizontally. To match a little more of the photo on the opposite page, I also completed the same cuts with a light green vellum and a light blue. The clouds are all popped up on foam adhesive and I love how it looks like they're floating! I used two different heights to add more effect in overlapping. I attached the vellum using red line tape, again in places where I knew you wouldn't see it. When I was going through my stash to look for something else to add I came across these enamel dots from Blastoff by My Mind's Eye. The iridescent ones reminded me so much of water that I ended up using all but two of them as raindrops falling from a couple of the clouds. I also found these adorable heart shaped mini paper clips by Doodlebug, and once I decided to add this 2x3 inch photo on the page I just had to add it in. It's hard to tell, but this tiny 2x3 photo is actually upside down. If you look closely there is a ripple in the water that gives it away. I did this on purpose because the photo on the opposite page doesn't do the refection in the water justice and I wanted to highlight it here.